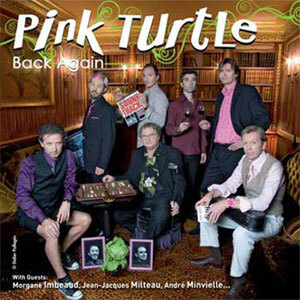 Musique : Pink Turtle "Back again" 2010. Pink Turtle "Back again" - 27 août 2010. 1 Maniac (Michaël Sambello - 1983). 2 Everybody's got to learn sometime (The Korgis - 1980). 3 Money money money (ABBA - november 1st 1976 ). 4 I can't get no satisfaction (The rolling stones - june 5th 1965). 5 Roxanne (The Police - april 1978). 6 Born to be alive (Patrick Hernandez - 1979). 7 Black magic woman (Fleetwood Mac - february 1968). 8 Sir duke (Steve Wonder - march 22th 1977). 9 Fifty ways to leave your lover ( Paul Simon -1975). 10 We will rock you (Queen - october 7th 1977). 11 Nights in white satin (The moody blues - november 10th 1967). 12 Billie Jean (Mickaël Jackson - january 2nd 1983). 13 Hey Jude (The Beatles - august 26-30th 1968).